Through Foreign Eyes sought to depict the distant between the artists, the community and the environment – highlighting the challenges they face in integrating into Singapore society. 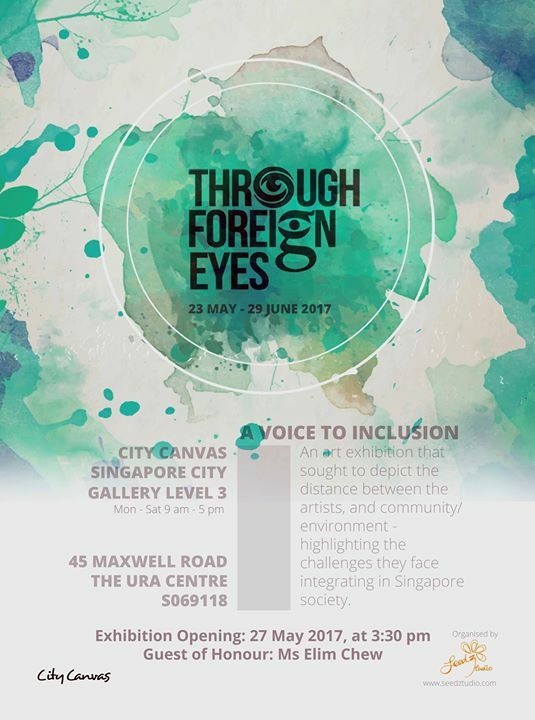 “Through Foreign Eyes”, we seek to uncover alternative “hidden” perspectives of our home, captured by unassuming artists – the people with special needs and the third cultural individuals. Captured unpretentiously “Through Foreign Eyes”, the artworks prove that beauty is not only found in indomitable skyscrapers, but also in the most modest of places, as seen from diverse perspectives. See how the artists portray their sense of belonging on this land or the place they identified as their home. As they navigate through the different places in Singapore, their intercultural communication competency with the space shapes their identity to create a sense of community and a sense of belonging. Our polished Little Red Dot has undergone remarkable makeovers over the years; take a bumboat down the Singapore River and you will be reminded of its opulence and magnificence. But have our attitudes towards the “Others” undergone similar progressive shifts? The exhibition offers you new perspectives and have you questioning your own biases, tolerances and personal values – a gateway to embracing people who see different from you and ”Through Foreign Eyes”.